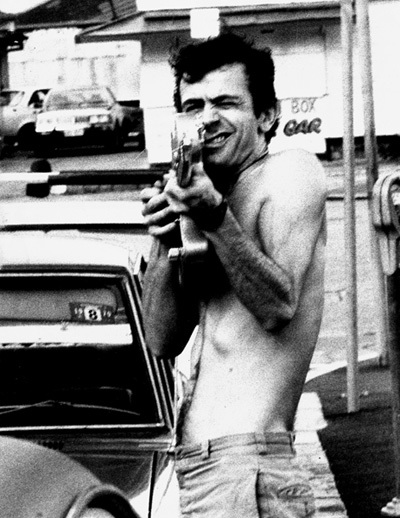 Hugh Cornwell (The Stranglers), outside the Queens Hotel, Brisbane, Thursday 1 March, 1979. Photo: David Pestorius. Since the late 1970s David Pestorius has been culturally active in his hometown of Brisbane, Australia, initially as a participant in the local punk/new wave scene, which produced such important groups as The Saints and The Go-Betweens. He performed in bands, photographed and wrote about them for local and national music publications, and between 1980–82 hosted a regular weekly new release program on radio 4ZZZ-FM. In the second half of the 1980s Pestorius began to work closely with visual artists, taking the formative experience of punk and allowing it to shape his activities in the world of art. Over the last two decades he has realised numerous projects, often in co-operation with major cultural institutions internationally, featuring a wide range of cultural producers, including artists, architects, writers and musicians. In 1993 Pestorius commenced to represent artists and work as a gallerist hosting public exhibitions in a range of spaces owned or controlled by him. Since 1996 he has participated in major international as well as local art fairs, including Art Chicago (1996, 1997), Coronation Motel Fair, Brisbane (1996), Art Basel (1997), Art Forum Berlin (1997–2006), Auckland Art Fair (2010), Sydney Contemporary (2013), and Spring 1883, Melbourne/Sydney (2014, 2015). In 1999, Pestorius was the first foreign gallerist to open a showroom in the new Berlin-Mitte, while later that same year he began to host exhibitions and events at the Pestorius Sweeney House in the inner Brisbane suburb of Hamilton. His most recent gallery enterprise, Australian Fine Arts, was launched in Brisbane’s official art precinct of Fortitude Valley in 2015.